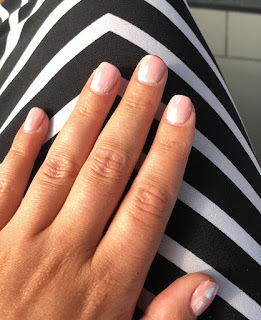 I love getting my nails done; and taking a break to get pampered at a salon for a manicure is great, but when time and money are limited, manicure at home is your next best bet. Yes, it might take some time because painting your left hand nails is something you will have to practice before you get good but in the long run its worth it. Step 2: Clip, file and buff your nails. Clip nails first, if necessary and then file to get your tips square or round whichever is your preference. Buff tops and sides of nails lightly with a nail buffer to create a smooth surface. Step 3: Push back and cut your cuticles. Soften cuticles with oil or lotion and then push back gently with a cuticle stick. According to Amy I m obsessed with my cuticles, which is prob true. I use this cuticle cutter and this cuticle pusher. Step 4: Apply the nail polish base coat. Apply base coat to hydrate and protect nails and prevent chipping. I use OPI nail Envy as my nails are pretty fragile. This is my go to product for having stronger nails. Step 5: Apply nail polish. Apply a coat of the color you chosen, staring in the middle of the nail top of your brush at the cuticle and then brush all the way down and into the corners of the nail. Apply second coat if you need to. I m currently obsessed with grey but my got to polish is black... and yes it is for all season. Step 6: Apply the nail polish topcoat. The topcoat protects your manicure from chipping and adds shine to nails. I use my OPI nail envy as both top and base coat. Step 7: Clean up rough edges and let your nails dry. I use a eye shadow brush dipped in nail polish to clean up edges. Step 7a: let your nails dry. If you think they are dry wait for 5 extra minutes. Apply your favorite lotion and you are good to go. Do you do your own nails or do you visit the salon? What are your favorite colors this season?